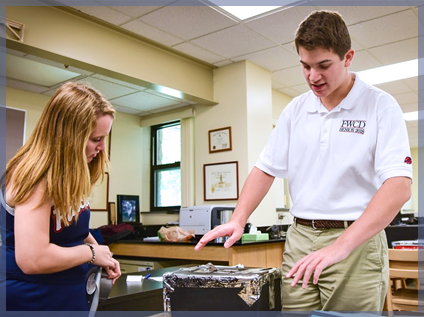 When Lance Mayhue ’18 took Astronomy through the Malone Schools Online Network (MSON) last fall, he had no idea that he would be selected by the professor to be involved in groundbreaking research and become a research contributor with a publication credit in the Journal of Double Star Observation. A National Merit Semifinalist, Mayhue took the course as an extension of the Fort Worth Country Day science curriculum—a course that was made available to him through MSON because of his commitment to academics and his ability to work independently. Kalée Tock, Science Instructor at Stanford Online High School (OHS), taught the semester-long course, which included approximately 16 students. The course introduced Mayhue and his peers to historical and modern astronomy, including topics such as the nature of light, the atom, telescopes and orbits. In addition, students learned about the lifecycles of stars and were introduced to dark matter and black holes. Through various activities and experiments, Mayhue engaged with current research, examining the modern astronomical data used to search for and categorize the thousands of planets outside the solar system. Mayhue was a standout in class. Tock took notice of him and three students from OHS, asking them to pilot a research seminar for her. She wanted the students to research double stars in the spring semester. For this sci-fi aficionado, the research was a perfect fit. “A double star could be either a binary star [two stars physically orbiting around each other] or an optical/apparent double star [two stars that only look like they physically orbit each other], similar to the Tatooine suns in Star Wars,” he said. The article will be published in the January 2018 issue of the Journal of Double Stars Observation, and the data was submitted to the Washington Double Star Catalog, which is the world’s principal database of astrometric double and multiple star information. Not bad to have an impressive publishing credential under your belt as a senior in high school. As a Malone Family Foundation School and a founding MSON school, Fort Worth Country Day is one of only 22 schools in the nation capitalizing on the virtual classroom to enhance its rigorous college-preparatory education. Offered to juniors and seniors, MSON courses take place in a virtual classroom two times per week and enhance each member school’s existing curriculum. At FWCD, they serve as an enrichment elective. Courses, taught by independent school teaching professionals who are experts in their fields, take a blended approach, combining synchronous instruction, real-time video conferencing seminars, with asynchronous instruction, recorded lectures and exercises that students complete outside of class. The experience lies somewhere between a “flipped classroom” and a virtual “Harkness table” learning experience.